We’ve already had a couple of training sessions (formative and restorative pruning) and with grafting coming up (bench and top). Helping Britain Blossom are helping five orchards graft 400 trees this year. That’s involved a lot of collecting graft wood (whilst pruning) and getting some grafting pliers. We’re also going to give the nifty Scionon grafting shears a go. The blossom is on its way and this will be celebrated with six blossom picnics all over the city. Like the trees, the people at the picnics will be sharing, only food rather than pollen. Each one will have a special storyteller and children’s games. The full list of events is here. There’s only so much support that a part-time worker can provide to the 60+ community orchards in Leeds so we have recruited a team of 9 “orchard mentors”. They have started to meet up with orchard volunteers to give advice, encouragement and signpost to others who can help. 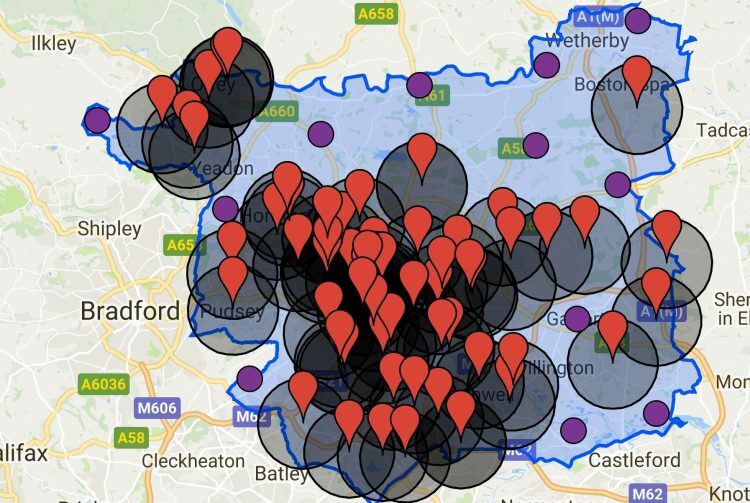 Almost everyone in Leeds is within walking distance (1.5 miles) of a community orchard in Leeds. But too many of them were planted with little community involvement and haven’t been as loved as they could be. So we are always on the look out for more volunteers to help maintain them and make use of them as community spaces. The training programme helps build the competence and confidence of volunteers to maintain them. But there are still some gaps where people aren’t close to a community orchard. We’d love to see community groups in the following areas interested in conceiving community orchards: Allerton Bywater; Mickletown; Methley Junction; Wetherby town; Garforth town; Gildersome; Drighlington; Bramhope; Bardsey; Thorner; Rawdon; Collingham; and Harewood. We couldn’t help all of these areas, but with the team of Orchard Mentors we can give advice, encouragement and training. Get in touch with Alan if you think you can help.